In business since 2001 we take pride in repairing sails and canvas products as if they were our own. We provide local repair services for the Connecticut sailor (seasonal), and also recieve sail repairs from around the country. Experienced in the art and science of sailmaking, we apply the craft to all of the products that come in our shop. 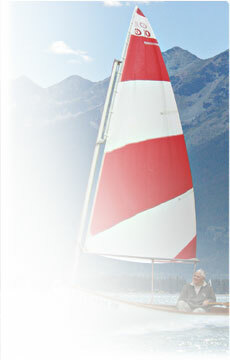 At Red Sky Sails we are your sail consultants, new or used. With your specific needs in mind we assist with material/cloth selection, sizing, and measuring, in order to provide an accurate quote on repairs, new sails, or canvas products. We offer new sails and sail cover systems by Doyle Sails and design and build custom canvas work such as boat covers, sail covers, or equipment covers. We are committed to quality workmanship with a good fit and high quality materials with the ultimate goal of superior customer satisfaction. We have done repairs for cruisers and racers along with power boaters, windsurfers, kiteboarders, and anyone with outdoor fabrics in need of repair. We are avid sailors, having owned and raced several classes of sailboats, in both one-design and PHRF handicap racing. We enjoy coastal cruising and trips to the islands, in addition to summertime dinghy sailing.